Good morning lovelies and HAPPY FRIDAY! How has your week been? mine has not been terrible. We’ve been pretty slow at work, which can be a good time to reset and take care of some disorganization within the office, which is exactly what I’ve been doing – along with studying for my Series 65 test. I have hardly done anything as far as exercise goes this week, but I finally made my way to the gym last night and ended up with a pretty good workout. I used a few things that I mentioned in my When you Can’t Run post – I only did 10 minutes of the incline workout because I didn’t want to put too much strain on my knee, but luckily it went very well and I think I could have survived the full 20 minutes. I also did the runner’s strength exercises, plus I looked up something quick on Pinterest (<—Follow me!) for runner stretches. I also scheduled out another 30 day squat challenge that will end on the exact day I fly out for Jamaica, so that’s pretty exciting and I went ahead and completed my 50 squats for the day, except I switch it up and end up doing a combination of squats & lunges for a total of 50 so I can work a few other muscle groups. Now let’s move on to the main topic for today and I’m not gonna lie, I’m pretty excited about it! This year I made a good list of goals to accomplish for 2015! One of those was to pay off my 3 highest percentage rate student loans (Hallelujah, I just paid off my first one yesterday!!!) I developed a budget at the beginning of the year to help me accomplish that and although I think the “cash envelope” system is a really great way to get out of debt and save money, I decided to take a more Modern approach to how I’m managing my money. Last January I joined in on Dollars & Roses (Now Marriage More) Savings Challenge to do the 52 Week Savings Plan and we had to use Capital One 360 for our savings. I ended up falling in love with Capital One 360 and after a few months, transferred all of my savings into this account. Then months later, they offered a promotion to open up a Capital One 360 Checking account, so I opened one of those up. I wasn’t exactly sure how I would use the checking account at the time, but when I started planning out my budget I found a way to use the Capital One 360 account that suited my current financial needs. (1) Make a list of daily living expenses – food, gas, clothes, hair or nail appointments, whatever you spend money on throughout the month. Try to be frugal with the list though so that you can actually have some left over for paying off debt at the end of the month. Consider cutting back on your eating out expenses and upping your grocery a small amount to eat at home during the week or cut back on your gas allowance so you’re not running errands for no reason or making late night trips to the grocery store for cookies & ice cream. Brainstorm ways that make sense for your life to cut back on your every day living expenses. (2) Write out your required expenses – your bills. (3) In date order, write out what a month looks like in regards to income & expenses so you can see how much you have left after each pay period & after each month if you stick to your budget. (4) Once you know what’s left, then at the end of the month you can put a certain amount of money towards your HIGHEST INTEREST debt. I don’t recommend putting all of your left over money to the debt, but if I end up with $1,010 in the bank at the end of the month (like the example) and I stuck to my budget, then I’d probably put $600 towards debt at the end of the month to leave some cushion for the next month in case something comes up or things get tight. Now, I’m sure you’re wondering how Capital One 360 falls into place and I promise it does! system is not as strict as the “cash envelope” system, but there are a lot of people, like myself, who fall in between severe credit card debt & multimillionaire who need a simplistic system that doesn’t feel too draining & strict, but that also places boundaries around your money. Although I haven’t perfected the system, it’s already made a big difference in my spending habits, I know I have limits and I have to be careful not to go over those limits, plus I love seeing the extra money at the end of the month sitting in my “bill pay” account that I can use towards student loans which is exactly what I did at the end of this month and I was able to pay off my very first student loan and it was one of my highest percentage interest rates out of all the debt I have! One other thought on the left over money – I strongly encourage paying off debt first of course, BUT if you also need to save up for something specific such as a trip, a new laptop, or Christmas, then you can take a portion of what’s left over at the end of the month to save towards that item and then put a smaller portion towards debt. It’s a flexible system that allows you to stay financially on track for what matters most to you at a particular time. Tip: The transfer of money does take a few days, so I would start by making your first “living expense” payment go towards the future 2 weeks. So you put the “living expense” in your account on the 5th of the month and that “living expense” payment will take care of you for the 15th-30th. Then you place another transfer after your paycheck on the 15th (say around the 20th) that will then cover expenses you have between the 1st-15th of the following month. This has been my major hiccup in the process, but I’m starting to use this method and I think it’s working much better! Previously, I was having to spend out of other accounts because my “living expense” was not yet available for use which In turn, had me spending over my actual budget. – If you have questions about this particular tip, feel free to drop a comment or e-mail me! 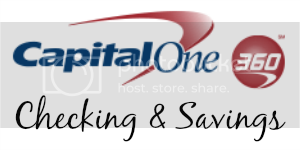 Do you use Capital One 360? If not, consider checking them out HERE! What is the biggest debt you can’t wait to get off your shoulders? To answer the questions: I just started managing my money this way and although it hasn’t been perfect, it’s been a really great system and it’s one that’s improving for me. My biggest debt weighing on my shoulders are my student loans. I have 3 (oh wait, TWO now!) with really high percentage rates and I’m working to get that paid off ASAP! I did just purchase a car in August, but my interest rate was really good (I assume based on my credit), so I’m not as concerned with paying that off quickly – at least not until I pay off all of my student loans.